And, apparently, a whole new Superman. As the world is rocked by riots and economic turmoil, DC Comics is restarting its Superman comics to match the current era. This month's new, milestone "Action Comics #1," part of DC's historic relaunch of their superhero line, is scrapping the old, goody-two-shoes Superman in favor of a hero who isn't afraid to break the law and lose his temper. "I think right now, we're all feeling that way," said Grant Morrison, the writer behind the new Superman in "Action Comics." "Nobody has much faith in their elected leaders in the same way that they did. We all have a lot more cynicism and a lot more doubt about the people who are running our lives than we did when Superman was a 'Boy Scout.'" The original "Action Comics #1," published in 1938, introduced Superman as the world's first superhero. A copy of the now-rare issue sold for $1.5 million just last year. That original series was published continuously since its debut, but August's "Action Comics #904" was the monumental final sequential issue. Now the legendary series starts over for the first time, and Morrison said he found the task of writing a new "Action Comics #1" "daunting." But he compared the era of Superman's first appearance in the 1930s to the current day, justifying the hero's reintroduction. "A lot of people were losing their jobs and losing their livelihood [in the 1930s], and a lot of people were realizing there was corruption in high places," Morrison said. "I think we're at that time again." 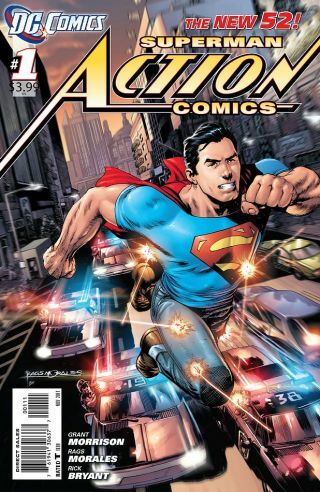 The new "Action Comics" - on sale digitally and in comic book shops Sept. 7 - and tells a very modern version of how a young, blue jeans-wearing Superman first shows up around 2005 in a modern yet dilapidated Metropolis, Morrison said. "Superman is just a guy who is very young at this point, and he has big ideas about what is right and wrong," Morrison said. "And he has the power to implement those ideas." Superman's alter ego, Clark Kent, has lost both his earthly parents before he gets a job as a reporter in the big city. As a result, Morrison said, Superman doesn't have the elderly Kents urging him to make nice with the world. "It means that he can maybe go a little too far," Morrison said. "To a certain extent, he enjoys being on his own because no one can get hurt and it's all down to him. But at the same time, that means there's no limit on him as he loses his temper." In the previous Superman continuity, Clark had been married to long-time girlfriend Lois Lane for years. But the new "Action Comics" has Clark as a bachelor again, with Lois dating another man and working as a rival journalist. Plus, this new Superman can't fly yet — leaping buildings instead — and he can bleed. Why? Because Morrison said he was too disconnected from the world, and readers had trouble relating to him. The writer's opportunity to change the Man of Steel's world on a dime comes as part of DC's line-wide "reboot" of their entire superhero universe, allowing creators and retailers the chance to get to know these decades-old characters when they're just beginning their crime-fighting careers and gaining experience on the job. "The whole thing we're doing in this new Superman is to watch him learn and grow and progress, and I find that's what makes the big difference," Morrison said. "The guy we had before was in his prime. He was eternally in his prime, and everything he did was going to work out. "So what we're trying to do is bring back that proactive Superman, but also allow him to change and to make these mistakes and to get beaten up a bit, and to have to come back and rethink his mission," he said. "I wanted to see him sweat a little and to bleed a little," Morrison said, "and to restore him to a kind of humanity that we could all understand before moving him on." This story was provided by Newsarama, a sister site to SPACE.com. Got a comment? There's lots of conversation on Newsarama's FACEBOOK and TWITTER!